﻿ California, 1968. Nicky Demasi, the first woman patrol officer on the Solaris City Police Department, is desperate to prove to her hidebound superiors that a woman can do the job. Shut out of the investigation of a gruesome ritualistic murder, Nicky is obsessed with catching Kasker Sleeth, the charismatic hippie she found standing over the body. But Sleeth isn't what he seems. He's the hellhound, an ancient creature of the Underworld temporarily clothed in human flesh. His mission is to retrieve an escaped damned soul in any way and at any cost—and Nicky is an impediment to his hunt. As more victims fall, Nicky must decide what she believes, and whether she can risk going outside the law to stop a killer bent on unleashing Hell. 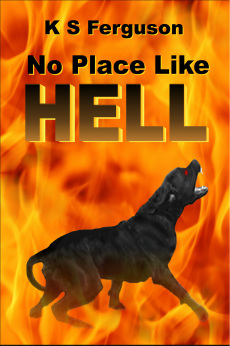 No Place Like Hell is the first novel in the Hellhound series.